Geneva introduces Model S Sound System for £299 | What Hi-Fi? We've tested a couple of Geneva iPod dock models from £1000-£1500 – the Model XL and Model L – but this is its most affordable version yet at £299. The Model S is iPod and iPhone compatible, has a built-in FM radio with alarm clock and new 'TouchLight' LED controls. Power output is 2 x 15W and the system includes two 3in full-range drivers with Geneva's EmbracingSound technology for a "wider, more dynamic soundstage". One neat touch is the proprietary 'PowerDock'. When the iPod or iPhone is removed, the motorised dock spins closed and the 30-pin dock connector disappears into the cabinet. 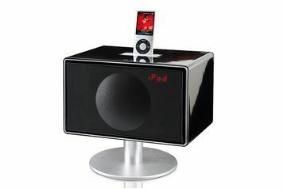 To reconnect an iPod/iPhone, the user just touches the cabinet and the PowerDock spins open. What's more, the LED controls on top of the cabinet are invisible until your hand reaches for them. Move your hand away and they disappear again. Very funky. Available in Geneva's trademark red, white or black piano lacquer, the Geneva Model S is supplied with a table stand and is available from Conran stores, twentytwentyone, SCP and other design stores across the UK. For further details of stockists visit www.csecustom.com or call Geneva Systems on 01423 359054.